/ Kwabena Boatang, a visiting scholar at the University of Southern Indiana, spoke about collaboration and local governance in Ghana. Kwabena Boatang, a visiting scholar at the University of Southern Indiana, spoke about collaboration and local governance in Ghana. 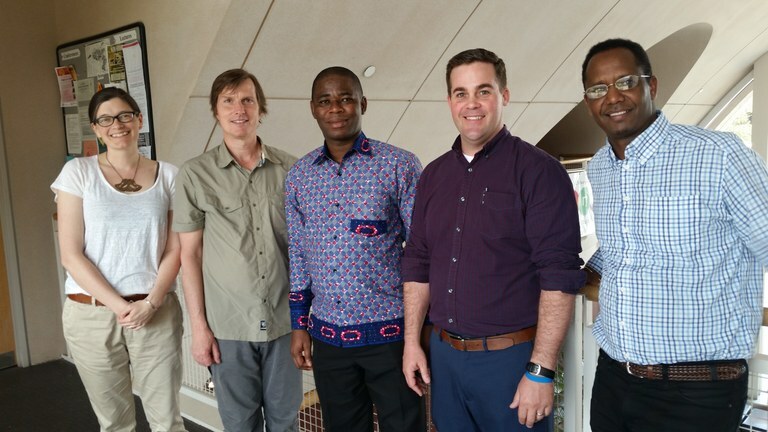 "Collaboration and its Challenges: A study of the collaboration between traditional authorities and local government actors in New Juaben Municipality, Ghana,"
In April, the Department of Anthropology hosted a talk by Kwabena Boatang, a visiting scholar at the University of Southern Indiana. Organized by Dr. Angela Storey, the talk addressed qualitative research conducted on the roles of multiple stakeholders in projects and activities related to local governance. Local government in Ghana has historically revolved around traditional authorities. However, colonialism and other currents of social change have transferred many powers and functions that chiefs previously performed into the hands of elected local government actors. Although this change has resulted in hostilities and conflict between traditional authorities and local government actors, these two agents of community development do also collaborate to enhance the living standards of their inhabitants. Qualitative research methods were used to examine the collaboration and challenges between traditional authorities and local government actors in New Juaben, Ghana. This study revealed that stakeholders do collaborate on activities and projects, including the construction and renovation of boreholes, school blocks, health centers, communal labor, etc. Challenges that hindered collaboration included partisan politics, chieftaincy disputes, and absentee chiefs, among others. Despite collaboration, chiefs have not been adequately represented in Ghana’s decentralized system. A proper integration will therefore enhance collaboration between these two actors.